After wrenching my brain for multiple hours, trying multiple solutions and checking Stack Overflow for PHP-based solutions to my problem -- I'm reaching out for help. Check array to see if certain values exist. I'm performing the above steps, checking for multiple values. I'm trying to call the API endpoint that I receive the array data from only one time, instead of once per check. If amenitiesArray contains smoking, show a green check. If amenitiesArray doesn't contain smoking, show a red X. If amenitiesArray contains pets, show a green check. If amenitiesArray doesn't contain pets, show a red X. 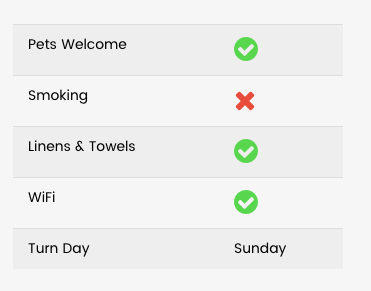 All values I'm looking for: linens, wifi, pets and smoking. Helpful Note: The amenitiesArray values are different for each product/rental property. The amenitiesArray may or may not contain the values I'm checking for. What is the best way to achieve this with PHP? just use in_array() I'm always checking for the same 4 values (smoking, linens, wifi, linens). For each of the 4 values, I need to display a green check if it exists in the array, or a red X if it does not.